As delicious as they sound! what a YUMMY breakfast on a cold Sunday morning! 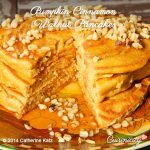 These Pumpkin Cinnamon Walnut Pancakes are made with organic white whole wheat flour which has all the nutritional advantages of traditional whole wheat, but with a lighter color and a milder taste. Here is one I like to use and another one that may be easier to find at your regular supermarket. 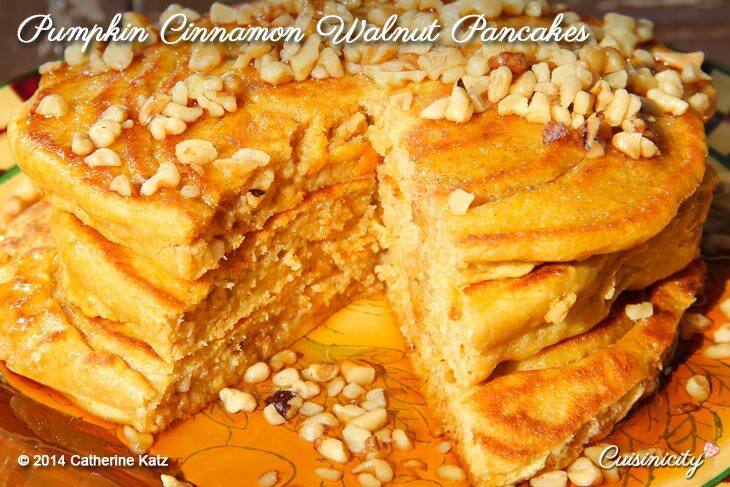 This recipe is very similar to the one for my Whole White Wheat Pancakes, but adds organic puréed pumpkin (100% pure–I like this brand), walnuts and a dash of cinnamon. These, topped with a drizzle of 100% maple syrup–WOW! I make a batch for you in my own kitchen here (in my PJ’s and all!) and show you my little trick to make it ahead! Now that only Gabe lives at home still, as much as he LOVES these pancakes (he’ll eat 6 at a time, growing young man that he is! ), I often have some leftover batter (this recipe makes 10 pancakes) and I like to keep it overnight in the batter dispenser for the next morning. It keeps really well in the fridge for one day. The only thing I would say is if you do that, you will need to stir in an additional 1 Tbsp of skim milk to the batter directly in the batter dispenser, the next day, because refrigerating it overnight will thicken it a little bit. It’s so delicious and so quick first thing on a school morning! Place flour and baking powder in a large bowl. Make a well in the center and add the eggs, skim milk, canola oil and pureed pumpkin. Add the walnuts and cinnamon and briefly stir again. 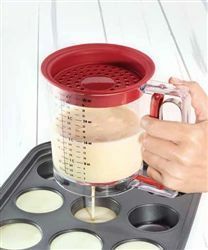 batter dispenser is great for making pancakes! What do you put on your pancakes, or do you just eat them dry? Hi Sandra, I use certified organic cold- or expeller-pressed canola oil with omega 3’s. I recommend you read my tip on “the verdict on Canola Oil ” here: http://cuisinicity.com/verdict-canola-oil/ I think you will find it helpful! Looks soft and fluffy! Question– do the walnuts stay suspended in the batter? Also, I am surprised to see you use canola oil, given its bad rap lately, nutritionally. Thank you for having this site! Sometimes alternative recipes don’t taste very good and these look fabulous!! Must be because of the French chef element! Thank you Ann for your delightful comment! Those pancakes are indeed so yummy, my family loves them!! I am not sure what you meant with the walnuts being suspended in the batter but they do blend nicely with the batter, if that answers your question. do you think these would work with plant-based milk? We were recently in Israel and picked tons of dates from a friend’s tree. We couldn’t bring back the fruit because it was against US agriculture regulations, so our friend suggested we make date syrup. My kids have deemed these pancakes drizzled with date syrup the world’s most perfect food. WOW Lisa, that sounds so wonderful!!! I love dates and can only imagine the yummy syrup! A BIG THANK YOU to your kids :), I am honored! I’d like to purchase a batter dispenser and try these pancakes. Can you tell me what brand you use ? I had those pancakes Christmas morning – cooked by the Chef herself – and they were beyond yummy. What a winning combination – delicious – nutritious and so easy to make. I know, because I watched them being prepared. Minutes folks – to having these on your table! Thanks my mom of the heart!! You are such a big fan, always!!!! I have prepared this recipe twice to celebrate Halloween with my kids. It was a hit. They loved it and I breath easier knowing it’s healthy! That’s really great John, you are one amazing dad! I don’t know if I would say your are “stealth” as your recipes are pretty honest and your kids are amazingly good natured about trying so many new things. Still, David and I agree, they don’t make them any more dedicated and just wonderfully determined than you, so….drum roll please, we name you the official winner of the “stealth Dad” award and I’ll send you a copy of David’s latest book, personally signed for you! If you could just e-mail me privately your address, I’ll have it in the mail on Monday. CONGRATULATIONS!!! You are just a joy to share my recipes with!